Pivitec’s Network Audio Interfaces leverage those advantages in your projects today. 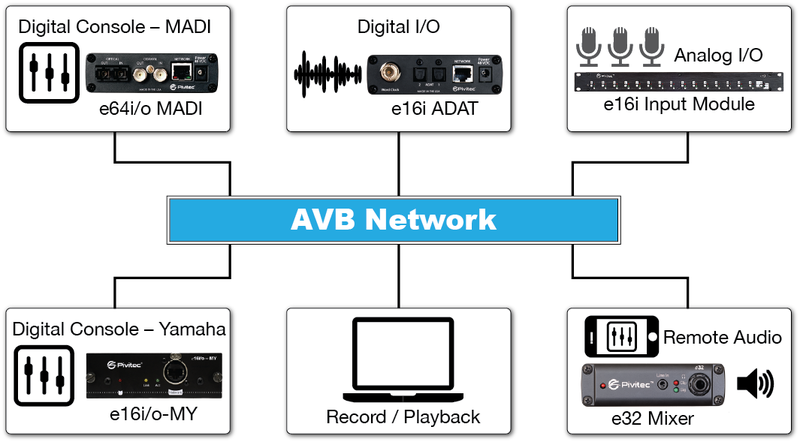 Based on a growing list of common AV industry connection standards such as Yamaha MY, MADI & ADAT, Pivitec’s Network Audio Interfaces are ideal for solutions in live sound, touring, recording, broadcast and commercial installations. By utilizing IEEE 802.1 Ethernet AVB Standards, Pivitec’s Network Audio Interfaces ensure a future-proof path to connection and compatibility with other manufacturers that utilize AVB standards in their products and networks. Pivitec’s Network Interfaces have versatile mounting, power and audio connectivity options that make them easy to integrate into your projects. Contact us to discuss how we can help you leverage the advantages of AVB into your projects today.